The CS141 MINI is a WEB / SNMP / MODBUS Manager for a Minislot Connector . This device supports a COM2 port like the professional CS141 for connecting a SENSORMANAGER, individual sensors like the SM_T_COM (temperature sensor), the SM_T_H_COM (combi-sensor for temperature and humidity), Pipe- Through RS-232, and all other COM2 options - however it has no AUX connector. 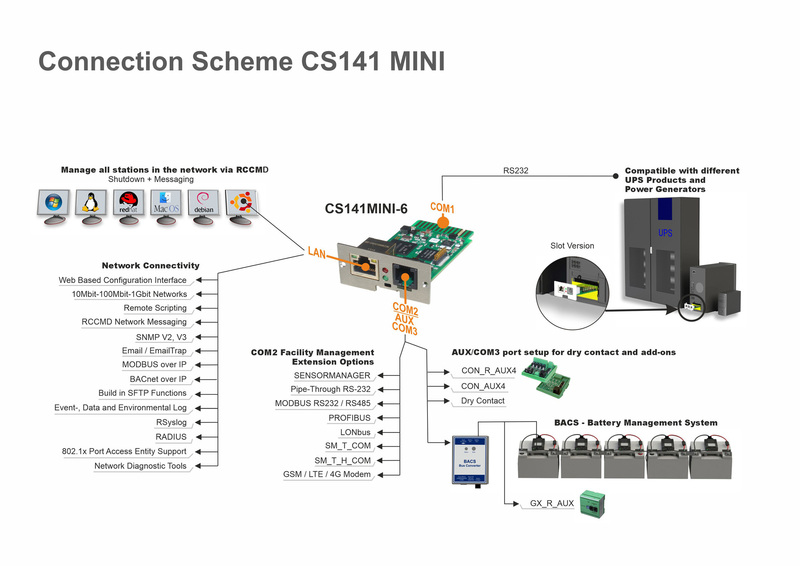 The CS141 MINI includes the CS141 Webserver and supports IPv6, HTTP, HTTPS, DNS, NTP, FTP, UPSTCP (UNMS), RADIUS, EmailTraps, SMTP(email client), MODBUS-over IP server and the full qualified RCCMD server which cares for the shutdown and messaging on all computers and OS in your network. The CS141 Minislot format is compatible to UPS from PHOENIX TEC, CENTRALLION, SOLTEC, EFFEKTA, AEG, ROTON, VOLTRONIC and all other UPS makers using this modern small footprint format. The device is operational within a wide range power supply of 9V-30V, power consumption is only 1,3 Watt. 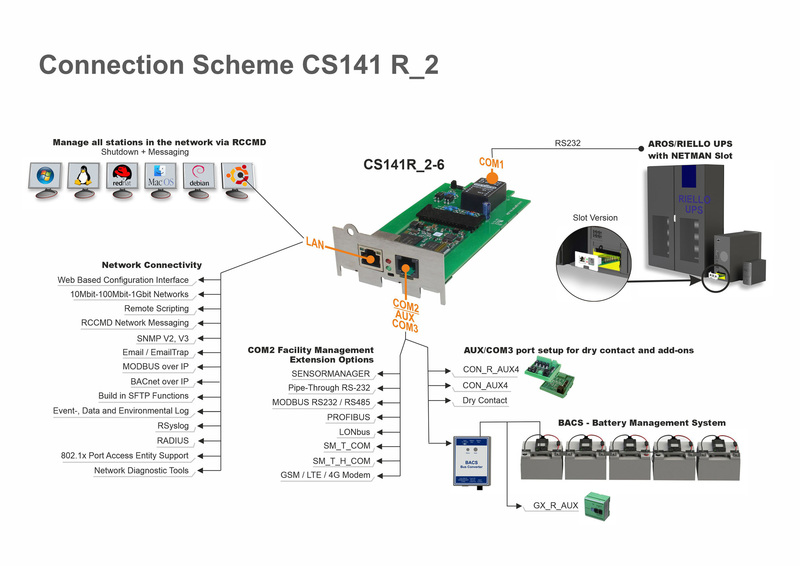 The CS141R_2 is a based on the CS141 MINI in a shuttle board to fit into RIELLO/AROS /PILLER NETMAN Slots with all functionalities of the new CS141 Mini. A special DC/DC converter takes care that the power consumption is extremely low and the shuttle board makes the CS141R2 ideal to replace the inferioe NETMAN devices coming with RIELLO UPS. The CS141R_2 is a powerful Web/SNMP slotcard for all professional users of RIELLO/AROS/PILLER UPS and replaces the NETMAN SNMP slotcards. CS141 MINI and CS141R_2 come with 1 RCCMD client included. More RCCMD licenses on demand.